With Thanksgiving and Christmas just around the corner, it is the time of year where we hear a lot about gratitude and thankfulness. While I don’t think these are things that we should just hear about a few months out of the year, it is the perfect time to introduce or reiterate what it means to be grateful and teach them ways to show this even at a young age. Toddlers and early childhood years are when many children realize that they get things pretty easily when it comes to their grandparents, or they receive gifts on special occasions for doing absolutely nothing. It seems like they quickly lose sight of the fact that they need to be appreciative and thankful of those special gifts or little acts of kindness that are shown to them. It is our job as parents to show and teach them how to appropriately show appreciation and the importance of having a grateful heart and attitude. I tried to come up with some ways that I could teach my toddlers to be appreciative of others and what they do for them besides the usual “thank-you”. It is important that children understand what it means to be thankful, not just have good manners. Who else are they going to learn it from if not from us? Because my girls are still so small, writing a thank-you letter was kind of out. 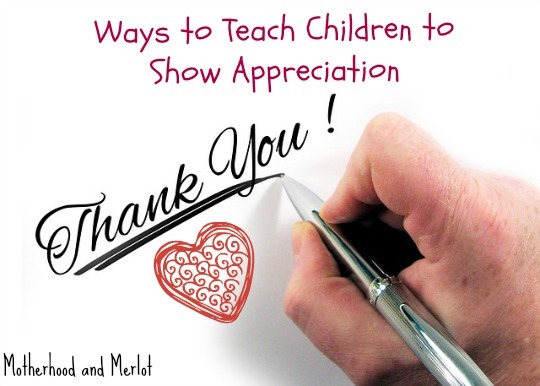 Here are a couple of ways that children can show appreciation to others in ways that they will understand the reason behind what they are doing. I am a big advocate for really being mindful of how much our children are spoiled, because I refuse to raise my children to feel entitled or like they should just be given everything and anything. Personal opinion, but I think this is the root of much larger issues. We have noticed that our oldest was getting into the habit of just expecting things versus saying “thank you” and appreciating them on special occasions. 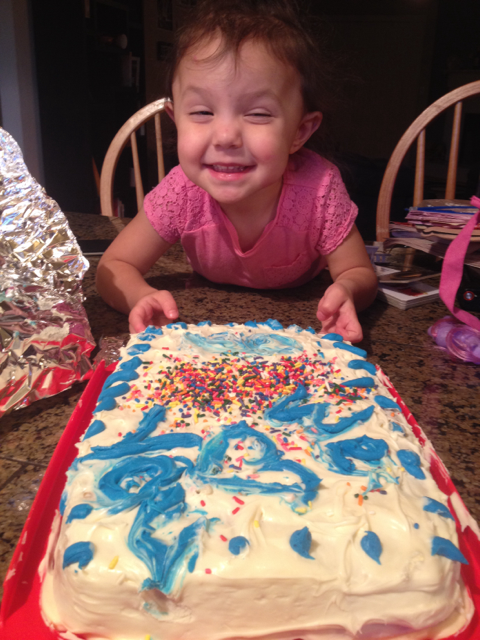 Something that I had her do when she was younger was bake them a cake and decorate it after they got home from a trip. I explained to her that we were doing it because they do so much for us and we are so thankful for them. She was obviously really loving the activity. Not to mention the fact that she got to eat the cake with them later. Giving them the appreciation that you are trying to instill in them is one of the greatest things we can do as parents. I don’t really like the saying, “Do as I say, and not as I do”, although it is necessary sometimes… But parents should do everything that they can to be role models for their children and we should want them to do as we do. Showing them how thankful we are for the little things they do will hopefully help them show the same to others. I also try as often as I can to say “thank-you” to others around me that help me with something, so that my girls can see that everyone needs to be thankful, adults included. I do not tell anyone else how to parent. However, one of my biggest pet peeves is when parents allow their children to be blatantly rude and do nothing about it. I am not one to say anything, but I sure as heck think it. My family was at the grocery store one day and I was waiting in the car with the kids while my husband ran inside. An SUV parked next to us and a family of three, with one child around 8 or 9 years old. The dad was waiting right next to the end of our SUV for him, and when his son opened the door he hit our car. The father had clearly seen me when he got out of the driver’s seat, and our car was obviously on. The son looked at me through the window, I looked in the side mirror to see if the father would come over… but then he just motioned for his son to come on. No apology. No wave. Nothing. I got out after and there was a ding where he had hit the car, but nothing that I would never be mad about. I was still waiting when they came back out of the grocery store and even had my window down as they both walked a foot away from me to get back into their car. Still, not a word. Allowing them to be disrespectful and rude is the opposite of teaching them to show gratitude and recognize when they should be thankful. It is giving them the grounds to never be thankful and to think that they don’t need manners to get through life, which is one of the worst things that they could learn. Bad manners are at the very top of my pet peeve list. Reminding them how wonderful it is that they have certain things or being thankful for family and friends will help to show them the true definition of what it means to be thankful. For our family, this involves making sure that we pray together as a family, often, especially before meal time and before bed. We thank God for our family, the food, and for giving us the day that we spent together. 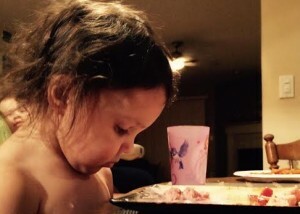 Every day that we sit down to eat, my oldest never lets us get away with forgetting to pray and thank God for our food. A child praying is one of the most precious sights to see. It’s in those moments that I feel like my work as a parent is actually doing something, even in a small way. What ways have you found to teach your children how to be thankful or to show appreciation? Haha I am hoping that by starting young it will stick… but I’m sure once mine hit those young teenage years it’ll all go out the window! I can’t believe a whole year has gone by. At least there are moments of goodness in the teen years but, it’s plagued with selfness. Not much has changed. Maybe a sign of them growing their autonomy? I started her out super young, she was always so helpful and kind. Great post Joanna, it is so important to teach children about appreciation early! It gets harder the older they get :)The cake pictures are the cutest! Such a great post, I love it. 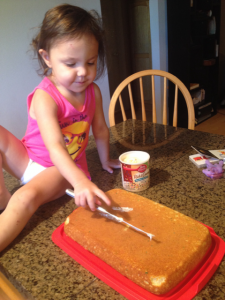 The photos of your little girl with the cake is just adorable. This is great, she looks adorable with the cake. I appreciate children who don’t forget their manners. Saying thank you is music to my ears. these are reallu great ideas – I hope I remember these when my baby gets a little older! Very great post 🙂 I will share with all my mommy friends! This post is the best! Thank you! 🙂 I think it’s so important to teach many important lessons to your little one! Thank you:) And thanks for stopping by! Cheers to you too mama! So awesome and so important to teach our littles these values! I agree with everything you said…. So sweet! My cousins friend has her son write thank you cards, or Im sorry I was mean to your cards. Aw, how cute! I always used to hate writing Thank you notes as a kid, but now I can’t seem to get enough of them! These are great tips. I feel like good manners are so important! It is so important to teach children appreciation so early on. we do it by giving back to others, and the kids choosing which toys to donate to charity. This is such a great concept to teach children. I love this idea. Great post! We’re working on this with our kids at work right now and it really makes such a huge difference in their attitudes when we remind them to be appreciative! We’re really big on manners. I love the idea of having them make something for someone. That’s just sweet. I love this post. It’s so important to start teaching manners early! I do find that my seven year old is starting to slack on that though, and this is a great reminder! such a sweet post. and AMEN to teaching kids manners! Thank you for this. Because not only does it teach your children to be good to other people, but it teaches them how to be happy. When we take a moment to appreciate our blessing and the people in our lives who add to them, it’s harder to take things for granted and end up resentful. Good for you! Hahaha it is not easy that’s for sure! These are such great tips! And we do need to teach gratefulness and good manners from the early childhood on. Later on it’s just too late. Love this and I completely agree with all of this! I think kids really mirror what they see so I always try to set a good example. My children copy everything I do as well! Such a great post! I’m still kind of upset over that story about the father and boy who hit your car!! Manners have to be taught, and I think in situations like that, it’s totally the parent’s responsibility to enforce an apology, not to sneak off as if it never happened. I’m definitely inspired by your point to express gratitude yourself, in front of your kids. They have to learn from somewhere! And also to remind them of even the little things they have to be thankful for. Great post! Gratitude is such an abstract concept. It’s a tough one for toddlers. I’ll be sharing! Love all of these ideas! Kids love making things, so having the intention as something to give to someone else is wonderful! Jill-Maggie May’s Gifts recently posted…Who Are These People? I love these ideas! My parents do so much for my family and my daughter likes to draw pictures for them. The other day she said to me, “Thank you for making me dinner mom.” I about died. What a sweetie!! She was/is one of those entitled kids that expects things to be done for her so we’ve really been working on it. I was so thrilled she showed appreciation without being prompted. But, things aren’t perfect. We still have a ways to go! These are great ways to teach gratitude to little ones! I will have to start teaching my little guy! Great ideas — especially love the idea of having them make something for someone else… a great thing to instill regularly for them as well. Great tips for all ages! Before my kids could write, we would always include a drawing or painting they made with a thank you note that I wrote. I love the idea of baking treats too, my daughter always wants to bake… and eat the treats too! I agree a million percent that rudeness and lack or respect are not to be tolerated. I always find it odd how rude people are during the holiday season, another reason I enjoy the non-gift related holidays a bit more. People forget the reason and meaning that should be associated with the season, which is sad. I commented yesterday too, I just wanted to say I love this post and thank you fo linking up with us!! These are really awesome tips Joanna! I too have a huge pet peeve about rudeness! And I so agree that we have to model for our little ones when we are grateful for the little things they do. Thanks so much for sharing on our link up! I love this post, Joanna. All of these ideas are so practical. The idea of having them make something to show appreciation is such a good idea. My daughter has been expecting more and not appreciating enough, so this post couldn’t come at a better time.